DAF CF Series Day Cab. DAF 310 Bhp Turbo Air To Air Charge Cooled Euro 4 Engine C/w Ad- Blue System. ZF 8 Speed Manual Gearbox. 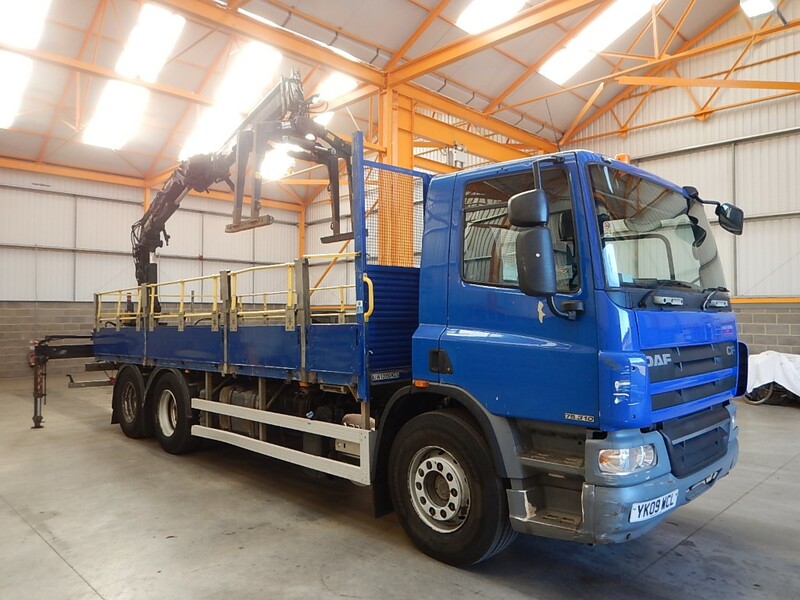 DAF Single Reduction Drive Axle C/w Diff Lock. Air Suspended Twin Wheeled Rear Lift Axle. Ecas Drive Axle Air Suspension C/w In Cab Controls. 21Ft Flatbed Body C/w Wood Panel Flooring, Raised Headboard And Aluminium Drop Sides. Aluminium Side Guard Safety Rails. Terex 120.2E Rear Mounted Crane C/w Rotating Brick Grab, Hydraulic Stabiliser Legs And Remote Controls. N/S/R Chassis Mounted Storage Locker. PVCU Vertical Engine Air Intake. 385 65 R22.5 Wheels and Tyres Fitted to Front Axle. Isringhausen Air Suspended Drivers Seat C/w Adjustable Lumbar Support. Electric Driver And Passenger Windows. Front Axle Weight: 9,000 Kgs. Plated Weight : 26,000 Kgs. Design Weight : 26,000 Kgs. Vehicle Height : 3.6 Mtrs. Vehicle Width : 2.5 Mtrs. Vehicle Length : 10.3 Mtrs. Tested Until End : February 2018. Mileage As Shown : 233,587 Kms. Fill in your email below and we will send you weekly updates of new vehicles and offers.